“My laptop was installed with Windows 7 with only one account, but no reset disk was created. Now I had forgotten my administrator password and don’t know how to reset it. Fortunately, if you have lost your Windows password, there are several approaches you can take for either recovering or resetting the forgotten password. In this tutorial we’ll show you how to reset Windows 8 or 7 password with the freeware NTPasswd (Offline NT Password & Registry Eidtor). 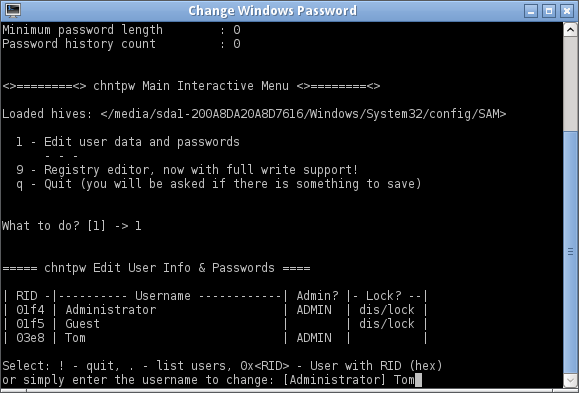 NTPasswd is a small Linux tool that allows you to reset Windows admin/user password on a computer where you forgot your password. How to Reset Windows 8 or 7 Password with NTPasswd? First go to the official website of NTPasswd and grab a copy of the bootable CD image. To install NTPasswd onto a blank CD, Right-click on the ISO file and then click “Burn disc image” option. If your system doesn’t have built-in support for burning, you can take use of the free burning tool ISO2Disc. When the bootable NTPasswd CD is ready, it’s time to reset your lost Windows password. Insert the CD into the optical drive and restart the target computer. You might have to adjust the BIOS to allow booting from the CD. After booting to the NTPasswd tool, you have to select which partition that has Windows installed. In most cases, there will be only one partition so you can just hit Enter to use the default value. 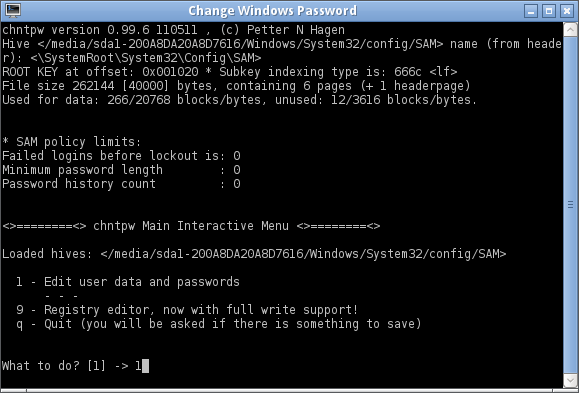 Next, select which part of registry to load, press Enter to leave it as default option which is “Password reset [sam]”. When you see the chntpw Main Interactive Menu, press Enter to select “Edit user data and passwords” option. 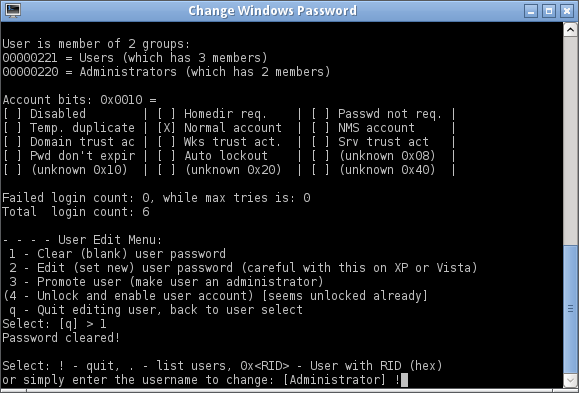 Choose the user account where you want to reset the password. You can find the RID, which you have to enter now, to the left of the username. On User Edit Menu, type 1 and press Enter to select “Clear (blank) user password”. If there is nothing wrong, you should see a message Password cleared!. Then, type q and press Enter to quit editing the user. 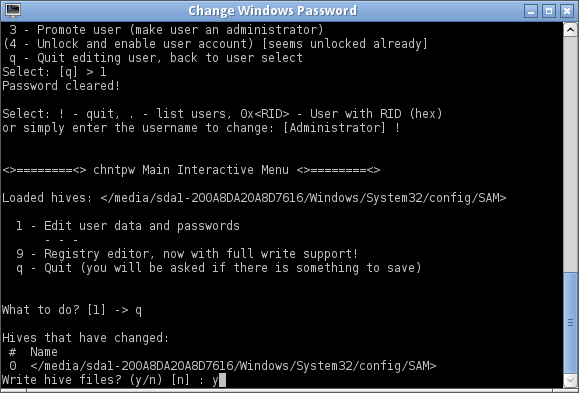 Next type q to quit the NTPasswd tool and type y to save your password reset changes. Press Ctrl + Alt + Del to restart your computer. You should be able to login to Windows without any problems — remember to change the password to something complex that you can still recall easily. 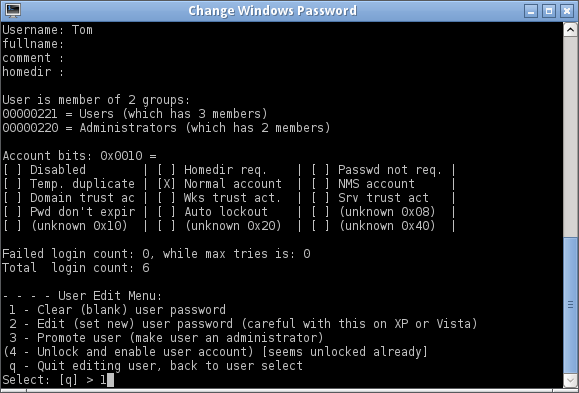 Note that NTPasswd could be used to reset password for local account only. If you need to bypass Windows 8 Microsoft account, or reset domain user password, you might need to take use of the commercial software PCUnlocker. If you forgot your Windows password you will not be able to log in to Windows. So what to do in this case? Is there a free password cracking software to reset lost Windows password? Answer is yes. In this tutorial we’ll guide you through step-by-step procedure of resetting lost Windows password using a free Linux-based boot utility – Hiren’s BootCD. 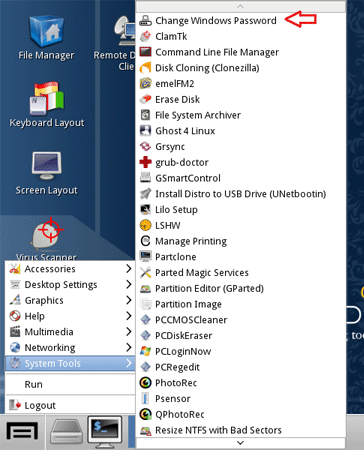 Hiren’s BootCD is an ultimate solution to almost all your computer problems. It comes loaded with hell lot of tools. Each of them is powerful and can be really very helpful if used with caution. You can solve nearly all your PC problems like virus infection, hdd failure, data recovery, Hard disk partitioning, password recovery using this CD. 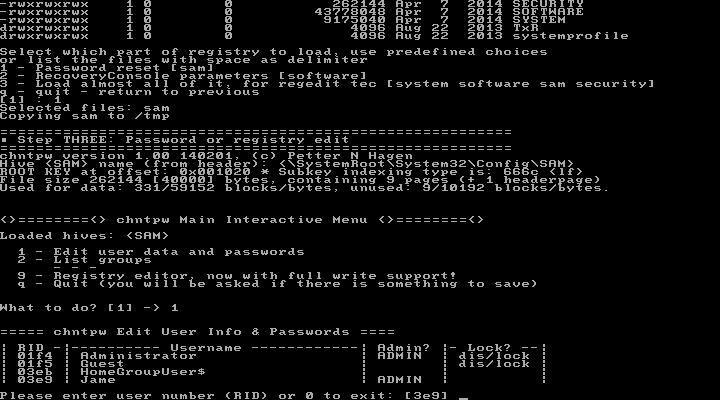 Note: Hiren’s BootCD a customized Linux distribution that you need to go through so many steps on Command Prompt to reset your forgotten Windows password. If you aren’t tech savvy, I recommend you use the Reset Windows Password utility which comes with GUI graphical interface. How to Reset Lost Windows Password with Hiren’s BootCD? To get started, download Hiren’s BootCD from here. Once the download is complete, unzip the download file and you’ll find two useful files: Hiren’s.BootCD.15.2.iso and BurnCDCC.exe. Simply burn the ISO image of Hiren’s BootCD to an empty CD using BurnCDCC program. Boot your locked PC using Hiren’s BootCD that you’ve created. 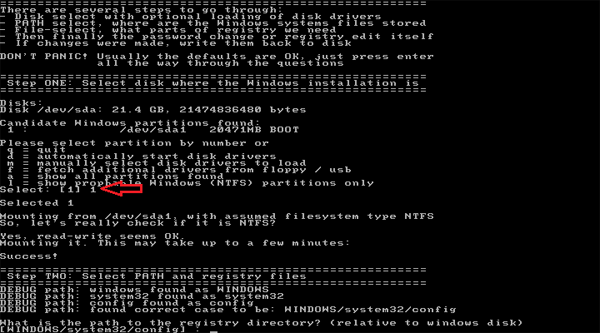 Make sure you have your BIOS set to boot from CD/DVD. 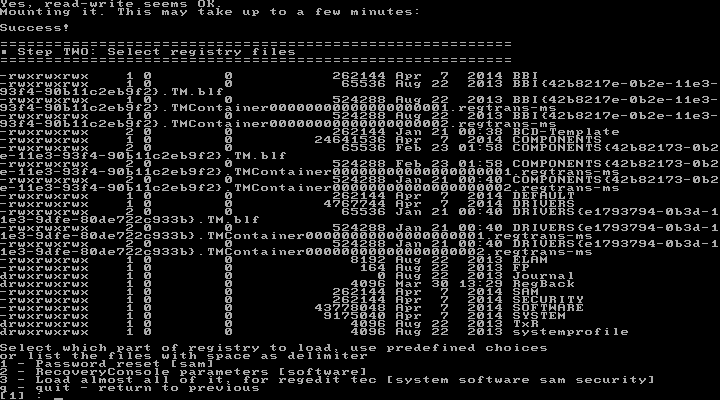 Once you boot from the Hiren’s BootCD, you’ll see a list of powerful system repair and maintenance tools. 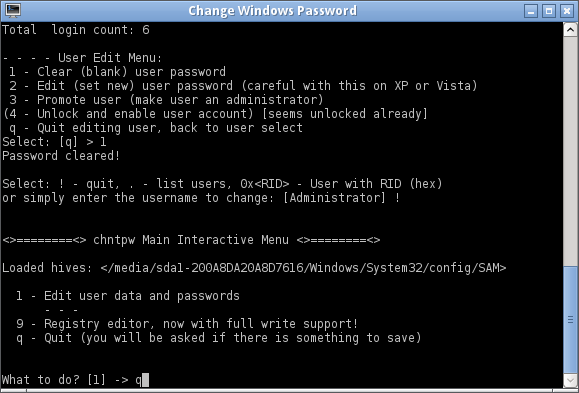 Choose the Offline NT/2000/XP/Vista/7 Password Changer and press Enter. 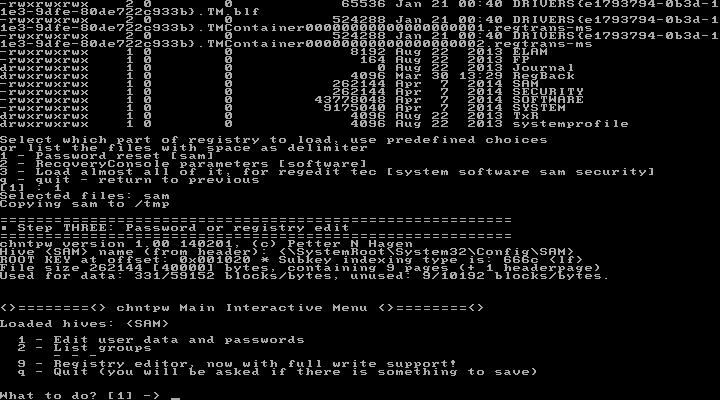 The screen will display a list of Linux Kernel Boot options. Simply press Enter to continue. Now the step to choose the correct drive where the Windows is installed. If you have more than one operating system then choose the correct drive and hit Enter. Here I will type “1” and press Enter, because the /dev/sda1 is the system partition on my hard drive. Next press Enter to confirm that your registry directory is WINDOWS/system32/config. When it asks you which part of registry to load, type “1” and press Enter. When the “chntpw Main Interactive Menu” is shown, type “1” and press Enter to choose the “Edit user data and passwords” option. 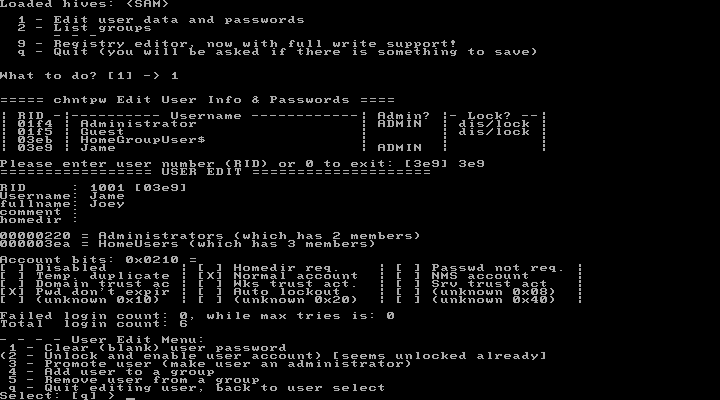 Now the screen will display a list of local user accounts existing on your registry file. 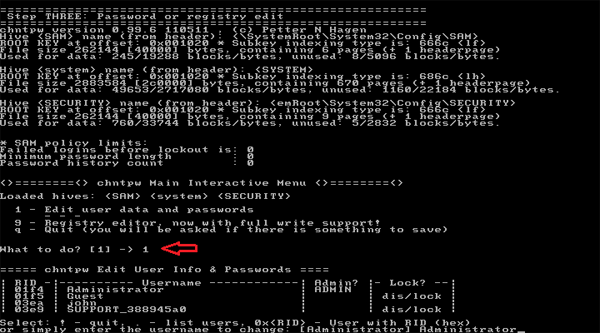 For example, if you want to edit Windows administrator password, type “Administrator” and press Enter. After successfully resetting your forgotten Windows password, type “!” to close the User Editor Tool. 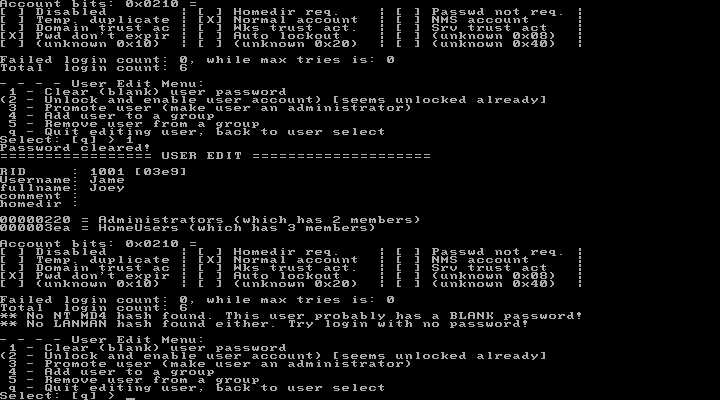 Now type “q” and hit Enter to close the Offline Password Editor and Registry tool. Now type “y” and hit Enter to confirm the password change. Now it will ask you whether you want to use it again or not. Just type “n” and hit Enter. Remove your Hiren’s BootCD and press ALT + Ctrl + Del to restart your system. You can then log on your computer with a blank/empty Windows password.